I never ever wear sunglasses. Yep, it’s true. It’s not that I don’t own them. Quite the contrary, I’ve spent a small fortune on really cool or uber-fashionable sunglasses. But I never put them on. In fact I’ve misplaced countless pairs because they’re never on my face. So why, you may be wondering, do I refuse to wear sunglasses? Well, you see, I’m crazy obsessed with light! 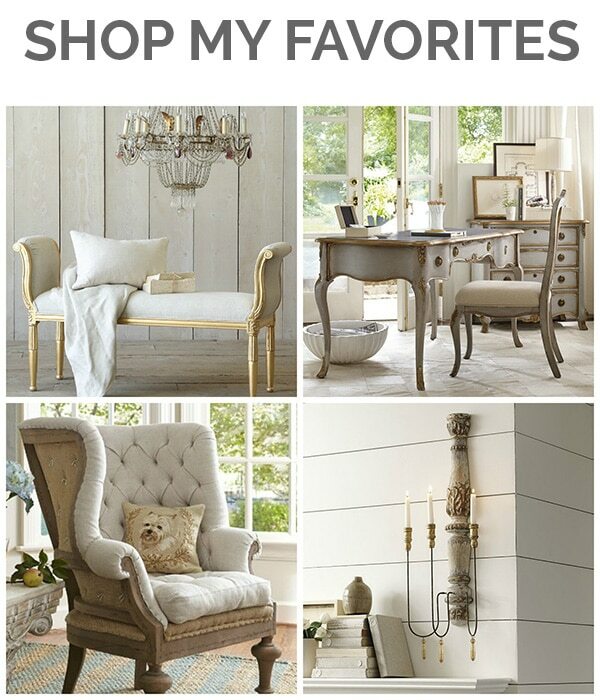 And there’s nowhere I’m more obsessed with light that in the home. I believe that light spaces are uplifting and can make you feel happier. 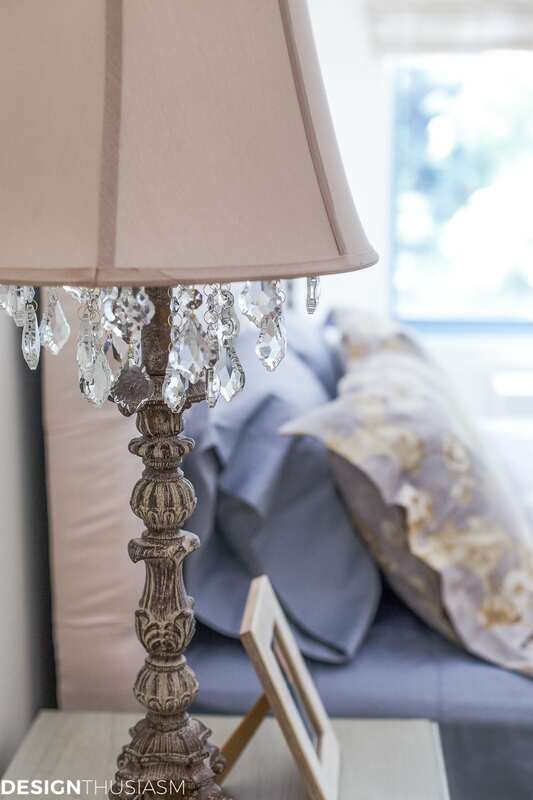 So if you live in a small space or are looking for downsizing tips, the very first thing I would say is that you need to take care to keep your rooms light. 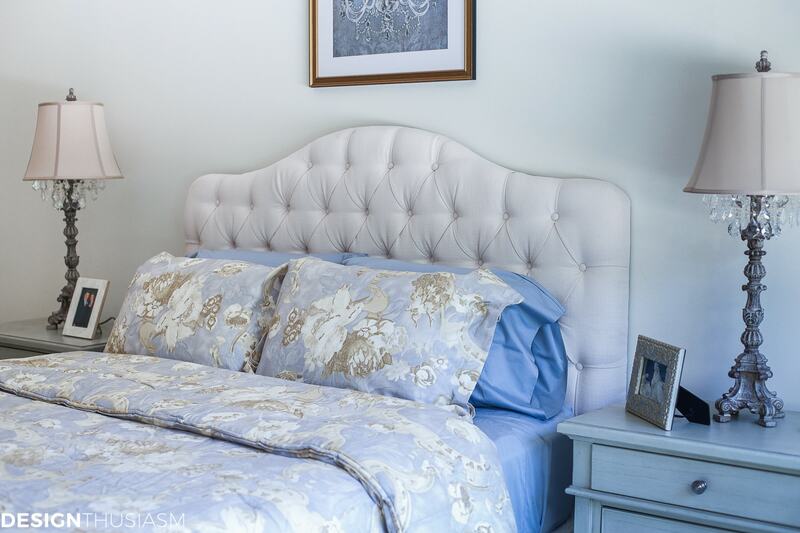 This can be done in many ways, beginning with natural light and the light fixtures you add. But that’s just the start. When my parents decided to downsize to an apartment, I helped them decorate their new space. (You can click here to see the downsized living room.) Their new bedroom has a nice large window and overhead lighting, but the space isn’t huge and is dominated by built in storage. 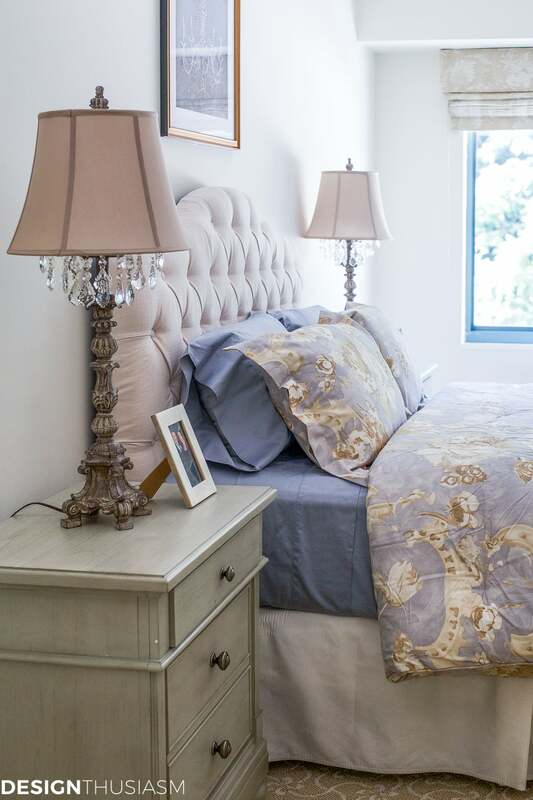 So the single most important thing we could do to keep it light was to work with a soft color palette. 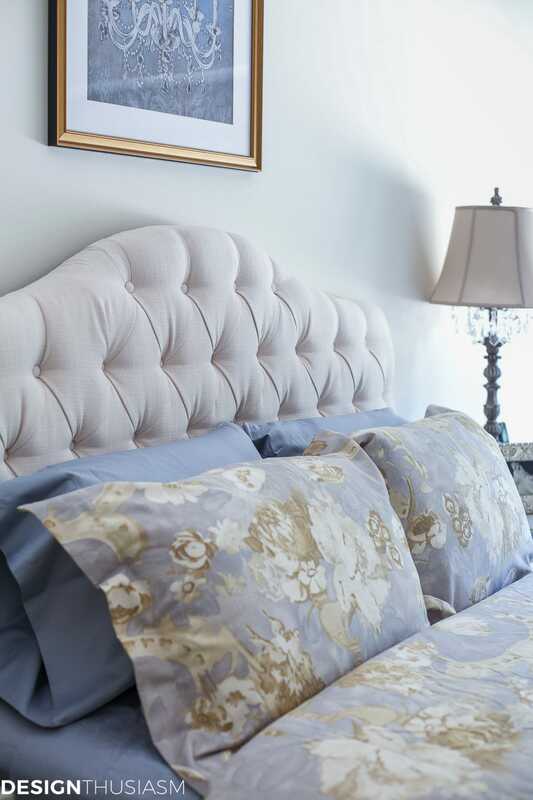 Tapestry beige walls set the tone and an ivory tufted headboard was chosen over dark wood furniture. The built in storage is a distressed cream, essential to keeping it from looking too heavy. 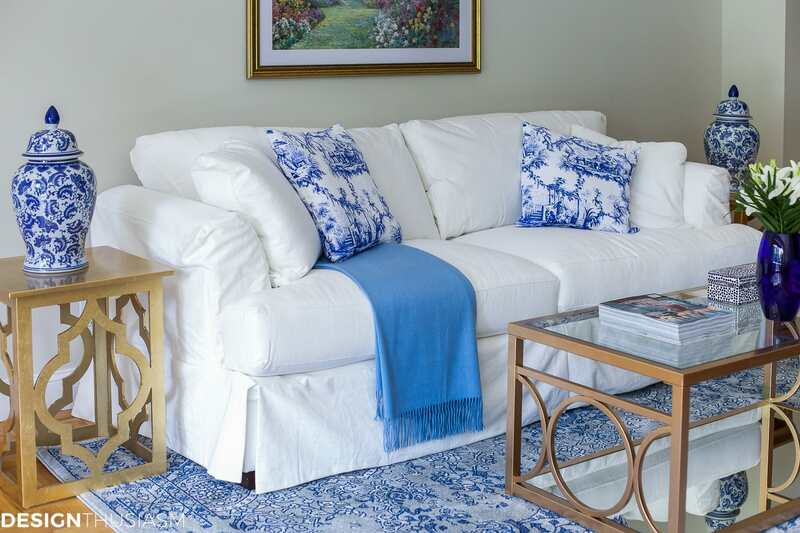 It offers the room amazing storage but is a very large piece that would be oppressive in a dark color. 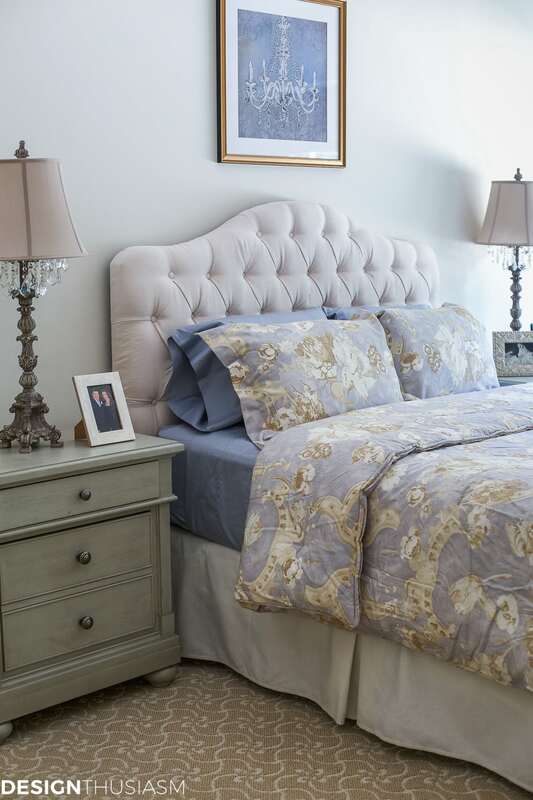 For linens I chose a pale blue and beige print to keep up the light theme, but honor my mom’s preference for blue. 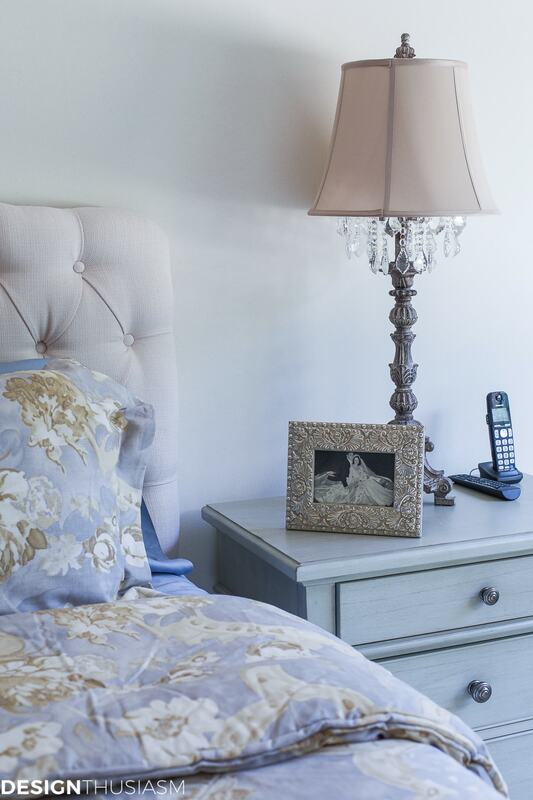 The bedside tables are a grey-beige and I used several accessories to bounce around light, from the crystal fringe lamps, to the silver in the frames. On a side note, I used my parents’ wedding photo on one nightstand and a recent photo on the opposite side, reflecting the span of their long marriage. 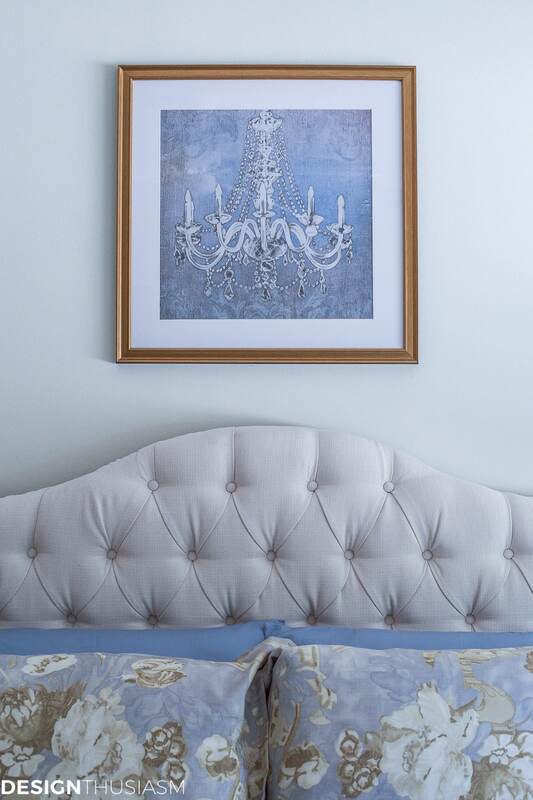 The artwork I chose for over the bed not only works with their color scheme, but also itself depicts a pretty light source, a lovely French chandelier. The gold frame adds another touch of warm light. A tonal beige window covering can be completely rolled up, allowing in as much daylight as possible. For the bedskirt I went with an ivory pique, again to keep the foundation light, particularly since the carpet is a patterned golden beige. The brilliant light that comes through the window illuminates a peaceful space. 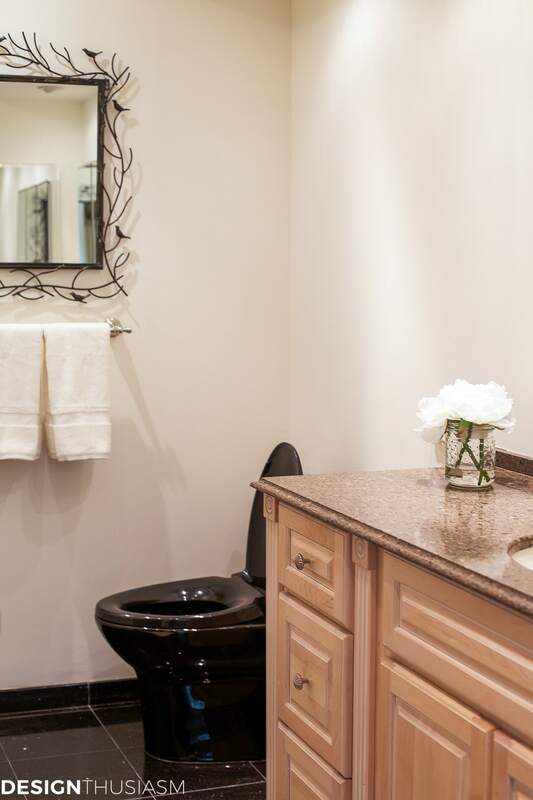 On the opposite end of the room is a small dressing area which then leads into the master bath. We had to work with a black marble floor, but we ripped out a dark wallpaper and painted the space linen white. 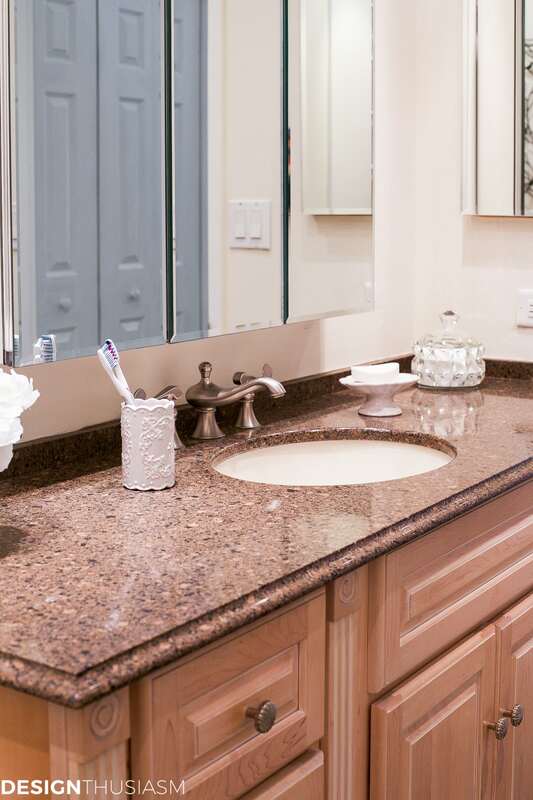 It’s amazing how much it lightened the room and enhanced the look of the neutral vanity. The final trick in lightening any room is a liberal use of reflective mirrors. 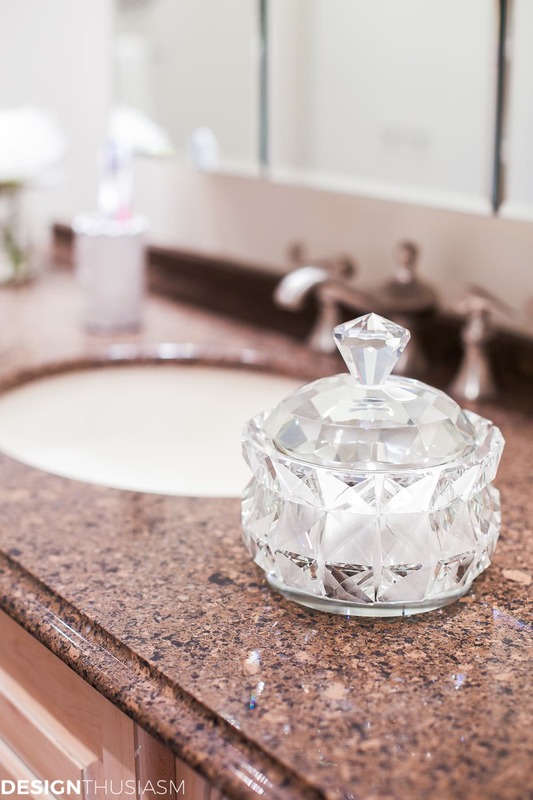 I also peppered the counters with crystal bath accessories, as well as a few ivory ones. 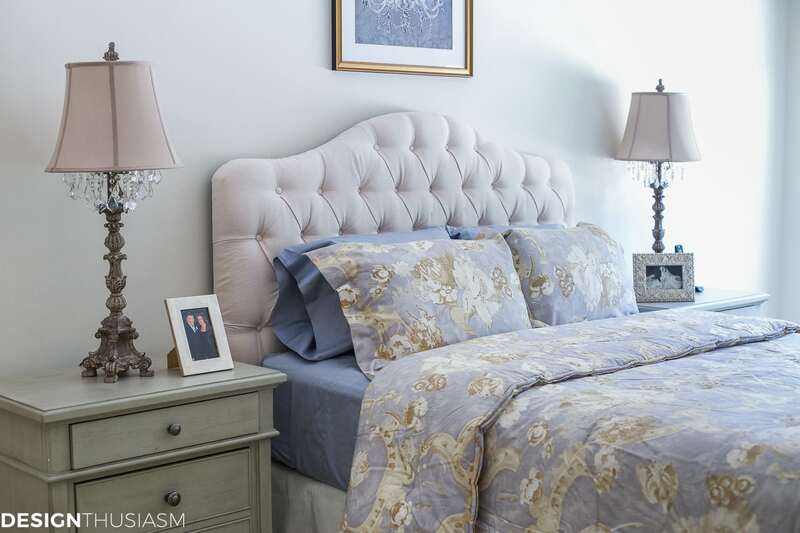 The result is a comfortable master suite that is tranquil and calm, chock full of storage but light and bright, nonetheless. Very beautiful. Did you use the white or gold lamps? I love them. Thank you for the tips as my inLaws will probably be making a change soon. I also enjoyed the video of your parent dancing. My dad was a wonderful dancer. What a beautiful bedroom!! love all the blues as it looks very rich!! Hi! Beautiful! 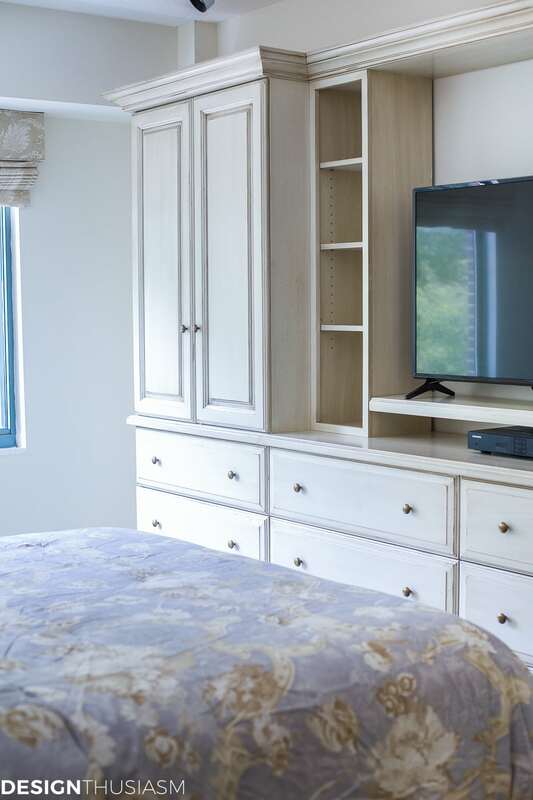 We are looking at having a custom built in made for our bedroom just like the one in your parents’ master. WOuld you be able to provide more pictures or more information like measurements? Thank you! Thank you Leigh Anne! The piece came with the apartment, so I don’t have the contractors specs. I could possibly measure it in the future but right now mom is in the hospital, so we’ll put that on hold for a bit. It really is the perfect piece though. It’s 6 drawers on each side like 2 side by side dressers and the cabinets above are on each side, with small open shelves for display towards the center. Then the very center is for the TV. Hope that helps a bit in the mean time.